Remember last Christmas when Apple released an app that gives you free gifts for the 12 days of Christmas? 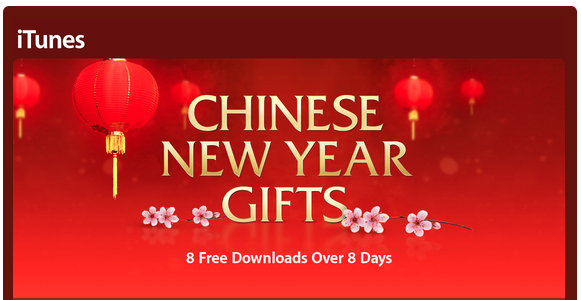 Well, there isn’t an app like that this Chinese New Year but it doesn’t mean Apple doesn’t love us, get freebies from Apple like music and apps for 8 consecutive days starting today. From 8 February to 15 February 2013, visit the iTunes Store and check out what Apple has got to offer to keep you antisocial entertained throughout the family visits and festivities. Happy Chinese New Year and enjoy the long weekend ahead.